For thousand of years, Alcatraz was a lonely island, occasionally visited, perhaps, by Ohlone and Miwok Indiands. Between the time the Spanish settled the Bay Area, in 1776, and the Yankees took over from the Mexicans in 1846, the island was noted on maps but it was otherwise unused. The last Mexican governor of California planned to erect a lighthouse on Alcatraz, but before it could be built, the country was annexed by the United States. Although the U.S. government had begun to study possible uses for the island (in fact members of the U.S. 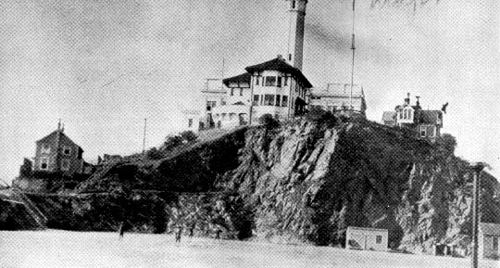 Corps of Topographical Engineers surveyed Alcatraz in 1847), it was the Gold Rush that spurred the building of the lighthouse and the fortification of its surface. The enormous wealth coming out of the gold mines dramatically increased San Francisco’s ship traffic as well as its population. By 1849, the city had ceased to be a sleepy outpost of 300 souls and was a bawdy, glittering home to more than 20,000 citizens. Then, by the time the Civil War broke out in 1861, Alcatraz had 111 smoothbore cannon, rows of open gun emplacements carved out of the island’s slopes, and a fortified gateway, or sally port, protecting the road to the brick citadel that crowned the island’s highest point. The city and its rich port were tempting targets for Confederate raiders, and Alcatraz , along with Fort Point on the south side of the Golden Gate, was an important part of the U.S. Army’s western defense plan. More than 400 soldiers were stationed on the island, and cannon batteries guarded nearly every flank. The latest weapons, including smoothbore, were included in 1864. However, military technology advanced quickly during the Civil War. Despite improvements, Alcatraz’s defenses became obsolete. Only in 1907 the army formally decommissioed Alcatraz as a fortification.